The Organic Research Centre has pioneered an evolutionary breeding programme to produce a hugely diverse population of wheat suited to organic and low-input farming systems. This year, for the first time, ORC is marketing it as ORC Wakelyns Population. Populations are genetically diverse. All plants are genetically distinct while all of those in standard pureline varieties are almost identical. This means that populations are better able to adapt to unpredictable environments, including weather and pest/disease pressures. 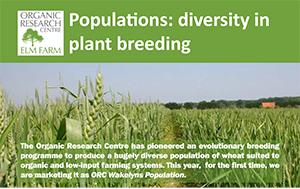 ORC has been working on wheat populations since 2001/02. The population was bred by making 190 crosses among 20 different parent varieties and mixing all the resulting seed. This has now been through eleven generations of natural field selection. Increased genetic diversity makes more efficient use of soil nutrients and water, lowers plant disease and pest levels and thus improves yield stability of wheat. Moreover, our choice of parents has produced a population which combines attractive levels of both yield AND quality. Up to now, it has been illegal to market such populations because they do not conform to EU law which currently ensures monocultural uniformity. From trials completed over the last decade we have been able to convince EU officials that the benefits of the population approach should be evaluated through test marketing at the European level. As a result, in March 2014 the EU law was changed to allow a trial period for marketing ‘varieties’ (populations) that do not fit the normal rules and regulations. The Organic Research Centre is showcasing its research at NOCC15, Organic Farmers & Growers (OF&G) flagship event hosted by John Pawsey at Shimpling Park Farm, near Bury St Edmunds on 7 July. There will be an opportunity to see the ORC Wakelyns Population in the field along with lines and mixtures of winter wheat originally selected from the Composite Cross Population. Other trials include the effects of grazing on black grass in arable rotations. National Organic Combinable Crop 2015, organised by Organic Farmer & Growers (OF&G) is the largest on-farm gathering for the UK organic sector.